Y’all. This is definitely one of those times something is much more than the sum of its parts. Because there are only three parts: salted caramel sauce. Vanilla ice cream. And pretzels. But the combination…oh, wow. The pretzels are so crunchy, and something about their flavor and texture whispers “waffle cone” to your brain. And their saltiness just ups the sweet/salty factor from salted caramel. It makes me never want to eat ice cream without pretzels again! So: open three containers. Don’t be stingy with the caramel or the pretzels. 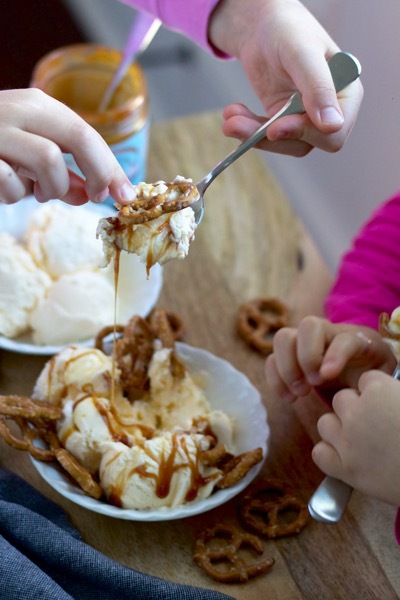 Don’t be afraid to add more caramel to the bottom of your sundae, if necessary. It’s also acceptable to use a pretzel as a spoon. Yield: As many sundaes as you want - this is great for a crowd! 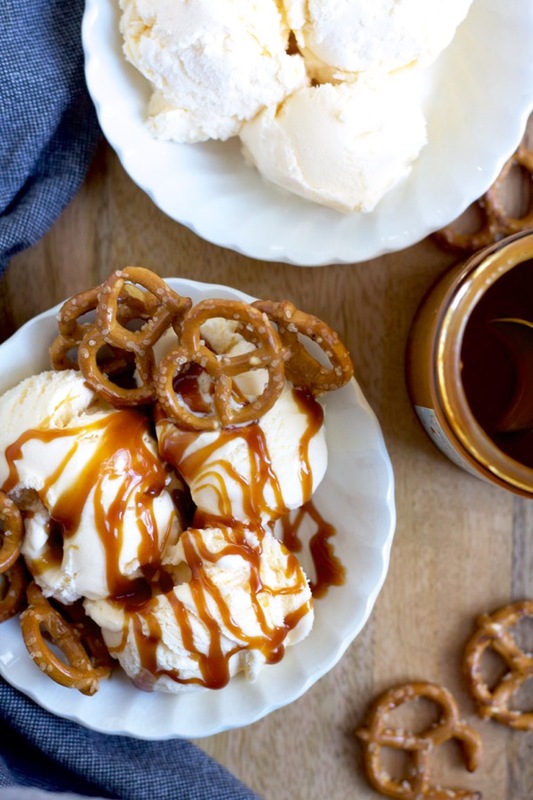 Scoop ice cream into a bowl, drizzle with a generous amount of warm caramel sauce, and top with crushed or whole pretzels. I love Trader Joe’s Fleur de Sel Caramel Sauce. If you want to make your own, I’ve made this recipe from Sally’s Baking Addiction and can highly recommend it! (Additional ingredients needed: sugar, butter, heavy cream, and salt. When I made this, I used salted butter so I used half the amount of salt in the recipe.) You can make it in advance and just warm it up again, so this can stay a super easy dessert to pull off! Serving Size: Hey, no one's judging you here. We scoop heavy at our house!